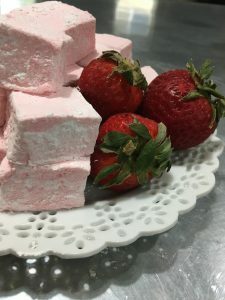 Fruity with just a hint of tang, these are the marshmallows of summer. They’re the ones I’d make for a child’s birthday party — Kavya loves them best of all the ones I’ve made so far. 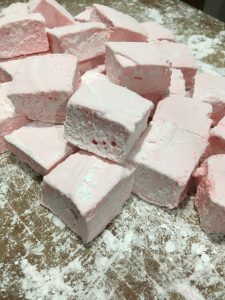 Sweet enough to please the kids, but light and fruity enough to delight adults as well. 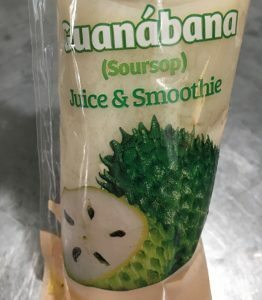 Soursop (also known as guanabana, custard apple, and Brazilian pawpaw) tastes something like a cross between strawberry and pineapple, with just a hint of banana. In northern America, your best chance at finding it is probably in Mexican grocers; look for frozen purees. 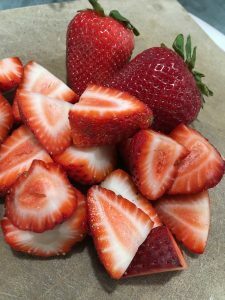 Combine with fresh strawberries for a delicious treat! 1. 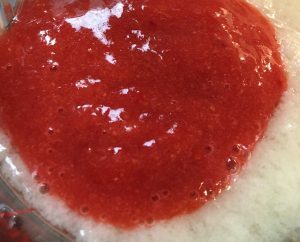 Empty gelatin packets into bowl of stand mixer (whisk attachment), with soursop and strawberry purees. Stir briefly to combine. 4. Continue to whip until the mixture becomes very thick and is lukewarm, approximately 12 minutes. Add food coloring, if using, during this stage.